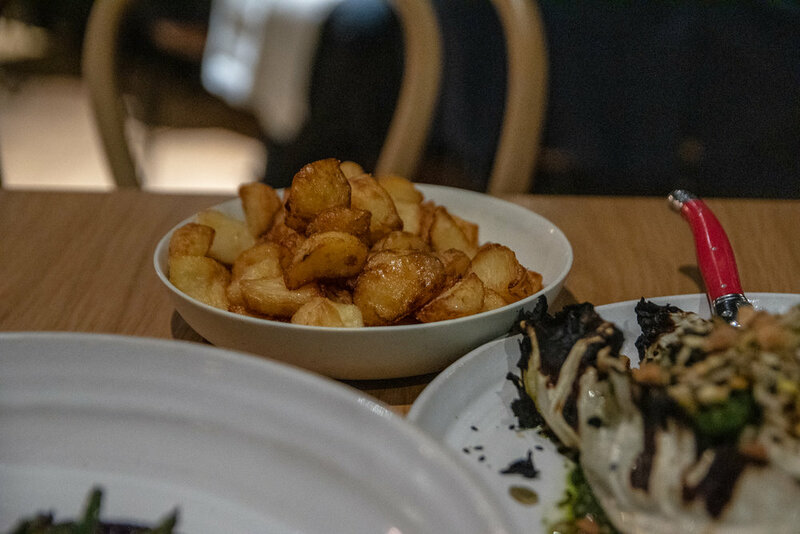 With Head Chef Trent Lymn at the helm, the menu is a wonderfully modern Australian drawing from influences around the globe whilst celebrating local produce. The resulting flavour combinations, whilst unashamedly avant-garde, work. Each course was well thought out, wonderfully balanced and interesting. Lymn’s years of experience in Europe (including owning his own café-restaurant in Argentina) is clear as each course is presented with elegance and finesse. To start, the dish of Organic tomato, Vanella burrata and romesco was wonderful. This cheese sensation demonstrated that unforgettable dishes can sometimes be very simple. In this instance, a ball of unadulterated burrata simply paired with tomato and romesco. When the outer solid mozzarella shell was cut, we loved how the creamy interior of soft, stringy curd and fresh cream revealed itself. The sumptuously rich yet sensibly balanced flavours were sensational. The dish of Fleurieu leaves was similarly delicious. A vegetarian dish that deserves through adoration an applause, we loved that these stunning leaves were celebrated and allowed to shine with little intervention. Together with lightly pickled beetroot, luxurious cashew cream and carrot snow, this was a truly elegant dish. The trend continued with wood roasted calamari – just yum. A clever and flavour laden dish with cheekily utilised the contrast of texture between the calamari and beady black rice which was beautifully seasoned with chorizo and saltbush zhoug. For mains, our steak was (as expected) exquisitely prepared. Displaying a mastery in the manner the steak was cooked, the inch thick cuts of beef was cooked perfectly from end to end. A light searing ensured that it was lined with a thin crisp layer packed with caramelised beef flavour. At expect the side dishes to blow your mind too. The from being just a side dish, denied due love and attention, the Josper roasted fermented cabbage was a welcome deviation from the norm. The roasted cabbage was full of flavour and adorned with mint pesto, almond and wattleseed. Our visit concluded on a sweet high with Caramelised figs, Burrata ice cream and soda bread crumb. Just yum! 2KW delivers excellent, unique food in a wonderfully understated, elegant setting. It provides a perfect backdrop to meet with friends over a cocktail (or three) and treat yourself to some of the good things in life.